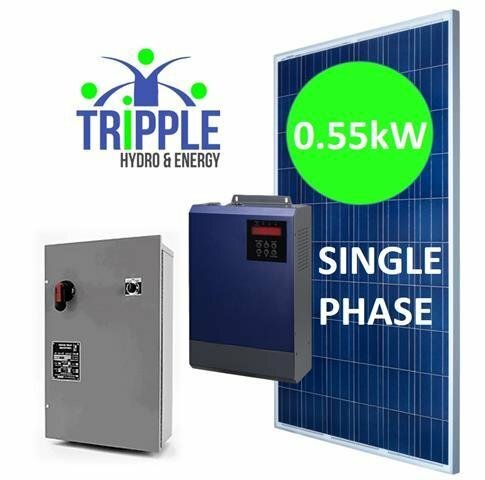 These single phase DC to AC Solar pumping combo's are driven by a solar pump inverter with an integrated MPPT (maximum power point tracker) to convert DC input to maximum power output. This unique pump inverter is used to convert DC power generated from the PV Modules to Single Phase AC power to drive any single Phase AC pumping system ranging from 0.37 to 2.2kW (submersible or surface pumps). The Maximum Power Point Tracking (MPPT) function ensures improved and overall system efficiency with the facility to adjust motor speed and startup voltages when specific speeds and pressure is required at startup. 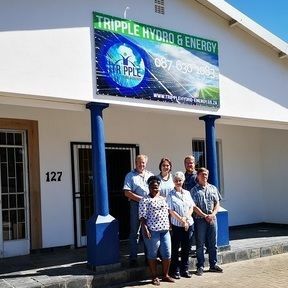 The combo comes complete with a Solar Pump Inverter, Pole or Wall Mountable DC/AC Enclosure, High Efficiency Renewsys Poly Crystalline Solar Panels, 10m Solar cable with MC4 connectors. Here a sample of how the system can be connected. 4 x Renewsys High Voltage A Grade (Poly) Multi Crystalline Solar Panels.